You are here: Home » GENRE » Scifi » The Handmaid’s Tale season 2 trailer: possible to go darker? The Handmaid’s Tale season 2 trailer: possible to go darker? Pushing beyond the perfect encapsulated book’s plot that gave birth to season one of The Handmaid’s Tale, here comes the second season, in which the misery of the suffering citizens of Gilead is extended – for reasons of profit or art? The viewers shall decide. Unlike in Gilead, where only the theocratic junta’s vote counts. Who ordered season 2? She did! She did! Not me. 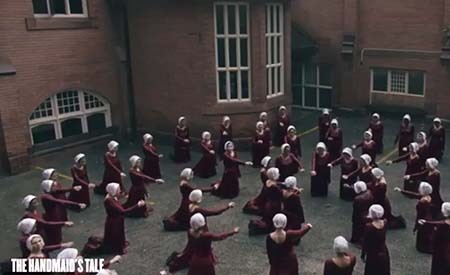 The Handmaid’s Tale: Season 3 trailer. The Handmaid’s Tale: second season trailer. The Handmaid’s Tale TV series (new trailer). « Spellwright (book 1) by Blake Charlton (book review).